Two Weeks to Go: Will the Legislature Act to Curb the Teacher Shortage? 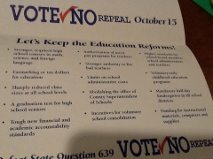 I have been pushing for #oklaed to have a one issue legislative session. I believe the only issue we should be discussing until fixed is #teachershortage. Recently looking at SDE documents I noticed #oklaed employed almost 60k teachers in 2008 and a little more than 52k in 2014. Mathematically it looks like we should have almost 8K Teachers looking for a job but we started 2015 over 1000 teachers short. We are setting records for alt certs and emergency certifications every year. Why is my issue so much more important than yours? What is your issue? One of the leading conservative minds in Oklahoma has accused us of blowing this issue out of proportion, but these numbers don’t lie. We have fewer teachers and larger classes. Imagine if we had kept all the closed positions open; we’d have several thousand vacancies! With less than two weeks to go, how are our elected leaders doing? Let’s look at Kevin’s six criteria and assess. Testing: In a recent survey conducted by our State Superintendent elect, testing was the first issue she needs to address. How many teachers have left our profession because they feel students are over-tested. If teachers are indicating in a survey that testing is the #1 issue, how can we fix teacher shortage without correcting our testing problems. As of late last week, word reached several of us who follow the Legislature that SB 707 is still alive, but barely. Although it appears that a majority of members in both chambers support this legislation, it also appears that a small few in the leadership do not. This is not the time for the few to bully the many. This is the number one issue – even more than pay – decimating our teaching force. Some of the opposition has centered on the ACT, which the bill does not explicitly name as the replacement to the EOIs. We have to start somewhere with reducing the emphasis on testing in Oklahoma schools. This bill does that. Teacher Pay: Ask the governor or any legislator how are we going to fix teacher shortage and most will mention teacher pay. So instead of starting with teacher pay start your discussion with teacher shortage. I would love to see many changes in the way we compensate teachers in Oklahoma. Starting pay should be better, but veteran pay should be a lot better. The distance between lanes for degrees earned should be widened. And state aid should be solidified through dedicated funding that will not be exhausted in one year. The scheme that has been floated to use money dedicated for teacher retirement fails on both counts. It is not a recurring source of revenue, and it hardly moves the needle. A $1,000 raise for teachers would be appreciated, but it would move us from 48th to 48th in teacher pay. Oh wait, that’s no move at all! Teacher Evaluations: Does anyone think VAMS, SLOs, SOOs, are any other acronym are good for teacher recruitment and retention. Without fixing our evaluation system we will continue to struggle with recruitment and retention. So far, nothing is fixed. We have hit pause on some things, but the terrible quantitative measurements of teacher effectiveness still loom. Teacher’s Retirement: Just the threat to change scares current teachers. If they change the system it will have a negative effect in the present climate. I hate to be against an idea until I know what the idea is but change today when teachers have zero trust for those proposing the change will not help teacher retention and recruitment. Technically, the legislators haven’t touched teacher retirement yet. Again, though, I should mention that the idea is being tossed around to divert funds for salaries – this one time only. The state treasurer is against it. The Oklahoman is against it. Don’t screw with retirement. Just don’t. School Funding: Have you looked at Texas, Arkansas, or Kansas school buildings lately. Recruiting teachers based on facilities if a non-starter for #oklaed. When you are 49th in school funding teachers find another state to work. Again, we seem to be getting nowhere. During the March rally, many legislators blamed the economy. Others blamed their leadership. Here’s a fun fact: your constituents didn’t vote for the House and Senate leadership. They voted for you! Own your agenda. Represent your constituents and answer to them. Forget the leadership. Forget the lobbyists who buy your coffee, breakfast, and lunch. Make things better or admit to the voters that you failed them. RSA, A-F, and other REFORMS are all legislative burdens that have landed in the middle of teachers desks and hamper teacher recruitment and retention. We seem stuck on these reforms. We still have the A-F Report Cards, and some in the Legislature are determined to make the Reading Sufficiency Act even more complicated. Let’s double the number of committees for our finishing third graders and have some for first and second graders as well. And let’s not fund any of this. And let’s make it clear to the dastardly education establishment that this is the price for keeping retention decisions in the hands of human beings. So far, I can’t point to a success. Yes, the Legislature managed to make dues collection for teachers’ associations harder, but that’s hardly a selling point. They make promises, but promises don’t buy bread. Promises don’t restore priorities and balance to teaching. Promises don’t entice college students and recent graduates to pursue teaching careers in Oklahoma. Action makes a difference. Nothing else. Concidentally, the teacher shortage was the topic of tonight’s #oklaed chat on Twitter. Here are some of my favorite comments from the discussion. A3 – #OklaEd has a teacher shortage. We started 2014-2015 approximately 1,000 teachers short. Throughout the chat, we kept coming back to the fact that salary matters, but so do the working conditions of our schools. I still believe that we’re losing teachers equally to both of these factors. We’ve tried and tried to explain this, but I don’t know if the politicians get it yet. We have two weeks left to make them get it. Call. Write. Email. Visit. Don’t limit your time to your own senator and representative. Pick several. Call the leaders. Even if they tell you to call your own people, be persistent. They chose to lead. This is what they get. Find their Facebook and Twitter accounts. Post articles using your own social media and get more parents and educators (and other citizens who care) involved. We have two weeks to make sure the people we may or may not vote to re-elect listen to us and do something of value to stem the teacher shortage. Use it well. I was in college when it passed – landmark legislation to reform and increase funding for public education. Having grown up in an education family, I heard the reasons why we should support this: smaller classes, better pay, new Kindergarten and early childhood programs. As a future teacher, it all sounded good to me – even the parts I didn’t understand at the time. 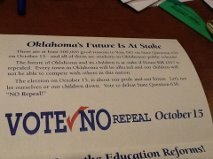 OKLAHOMA CITY (April 27, 2015) – House Democrats on Monday marked the 25th anniversary of House Bill 1017, the landmark school reform measure enacted in 1990 to substantially improve the state’s common education system. 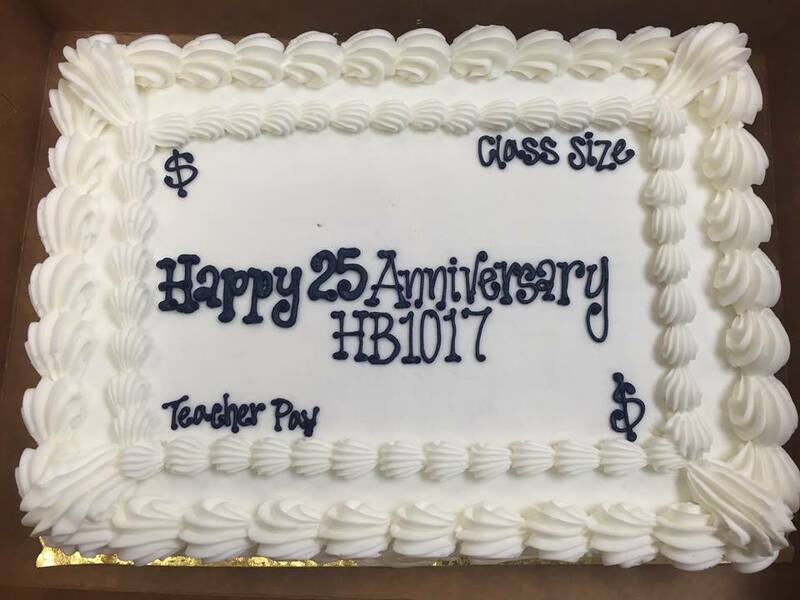 The legislators were joined by educators for the celebration, which was replete with a custom-baked cake, in the House Lounge at the State Capitol. “We gathered here today to commemorate the passage 25 years ago of this historic piece of legislation and to reflect on its legacy,” said House Democratic Leader Scott Inman, D-Del City. Prior to 1990, Oklahoma steered away from drastic reforms that departed from the core of public education in the state since the 1960s and ’70s: local control. However, realizing that education reform needed to be broader in scope to ensure that all Oklahoma children would benefit, both the executive and legislative branches of the Oklahoma government began to work with various stakeholders to attempt to bring Oklahoma to the forefront of achievement. Then-Gov. Henry Bellmon, this state’s first Republican governor, signed House Joint Resolution 1003 creating “Task Force 2000” in May 1989, sparking what has since become a constantly changing tide of reforms and budget battles over education for the last 25 years. Later that same year, then-House Speaker Steve Lewis began to develop his own education plan, “Education: Challenge 2000.” The Legislature went into a special session dedicated to the bill and spent seven days ironing out the myriad provisions of this singular piece of legislation. House Bill 1017 was the culmination of Task Force 2000 recommendations and Speaker Lewis’ plan, and was endorsed by several thousand school teachers who thronged to the Capitol for a rally in support of the measure. The bill was signed into law by the late Governor Bellmon on April 25, 1990. HB 1017 is widely deemed to be the single most important piece of legislation regarding education reform in Oklahoma. Yet in the quarter-century since passage of the bill, Oklahoma has experienced a substantial increase in students, fluctuating budgets, and the dismantling of several key reforms. Progressive increases in the minimum teacher salary schedule were scheduled. Maximum class sizes were established at 20 students for grades 1-6; 36 for grades 7-9; and 120 students per day for grades 7-12. Also, class sizes were incorporated into a school’s accreditation criteria. Statewide curriculum standards were introduced. In the future, high-school graduation would be based upon attainment of specified levels of competencies in each area of the core curriculum, rather than upon simply the time a student had spent attending school. Norm-referenced testing was established for grades 3, 5, 7, 9 and 11, to provide a national comparison. HB 1017 intended for millions of additional dollars to be pumped into this state’s public school system. The legislation mandated that members of local school boards and the State Board of Education had to have obtained either a high-school diploma or a GED diploma, and continuing education was required for members of local school boards. Half-day kindergarten attendance became compulsory in 1991-92, and school districts were encouraged to offer all-day kindergarten starting in 1993-94. In addition, school districts were permitted to offer pre-K for at-risk children, to supplement the federal Head Start program. The office of County Superintendent of Schools was abolished. Hands-on vocational programs for all students were encouraged. 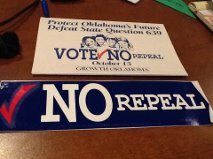 These were great reforms and made an impact in Oklahoma for a generation. That almost didn’t happen, however. As soon as Republican Governor Henry Bellmon signed HB 1017, the repeal effort began, culminating with the vote on State Question 639 on October 15, 1991. It took 126,796 signatures to get the question to the ballot. In the end, the initiative was defeated by a vote of 54% to 46%. For some reason, I’ve saved the bumper sticker and brochure all these years. I thought I had also saved the column I wrote for the OU Daily at the time (which triggered a few angry phone calls from 639 supporters – my first experience with that). I can’t find what I wrote anywhere online, but I can find what then-Oklahoman editorial writer Patrick McGuigan wrote. I’ll spare you the details, but it’s a laundry list of reasons for the state question’s supporters to have hope. I don’t remember the graduation test that came from 1017. Do you? Honestly, don’t these reforms sound familiar? Standards…check. Financial accountability…check. Firing bad teachers…check. School consolidation…check. Some ideas just never get old. We hear the same things from reformers now, but without the funding promised in 1990. In the 1988-89 school year, Oklahoma ranked 48th in the nation and next-to-last in the region in average teacher salaries. The average teacher salary in Oklahoma 24 years later, in 2012-13, was 48th lowest in the nation, last in the seven-state region (Colorado, Texas, Missouri, Kansas, Arkansas, New Mexico and Oklahoma), and almost $12,000 below the national average, according to the National Education Association. HB 1017 provided that in 1994-95, the salary for a beginning teacher in Oklahoma would be $24,060. In comparison, the lowest salary on Oklahoma’s minimum teacher salary schedule 20 years later, in 2014-15, is $31,600. Oklahoma’s minimum salary scheduled has not increased since 2008. Oklahoma’s average annual teacher salary is just 78% of the national average. At least in part because of relatively low salaries, the ratio of public school teachers in Oklahoma with advanced degrees today is 24.8%. In contrast, 41% of Oklahoma’s teachers held advanced degrees in the 1989-90 school year. School accreditation is no longer tied to class size; today all 500+ school districts in Oklahoma are exempt from the mandate. The current average is 17.8 students for each teacher, and 11.9 teachers for each administrator – the highest ratio in 20 years. Schools may be deregulated from any mandate that does not affect the health and safety of the students without losing accreditation. Dan Nolan, an AP History teacher at Norman North High School, said he has “29 chairs but 36 students” in one of his classes. Nolan was a finalist for State Teacher of the Year in 2009. Testing mandates have been amended by the Legislature every year except two since passage of HB 1017 in 1990. Norm-referenced testing has been replaced with criterion-referenced testing for grades 5, 8 and 11; the number of tests has grown substantially; a revolving door of five different testing vendors has caused concerns among educators, parents and legislators alike; and the state continues to spend tax dollars on testing results that do not provide a method to track progress from year to year as the standards change, nor to track a student’s fundamental growth of knowledge. 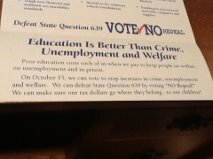 Oklahoma has spent $81.7 million on testing since 2004. Revenue allocated to Oklahoma public schools remains below funding levels of a few short years ago. Oklahoma’s Republican-controlled Legislature and Republican governor have cut public education funding by 23% — more than any other state in the nation. The $2.507 billion appropriated for public schools for Fiscal Year 2015 was $64.5 million less than the $2.572 billion appropriated five years earlier, in Fiscal Year 2010. The instructional budget declined in four of the five years between the 2006-07 school year and the 2011-12 school year. As the “1017 Fund” has grown, legislative appropriations for common education have decreased. For example, the 1017 Fund increased by $91.2 million from FY 2012 to FY 2013. In comparison, state appropriations to education during that same period declined by $93.3 million. Local and county funding for public schools has increased four times faster than state funding; consequently, districts that have lower property valuations are able to generate less funding per student. Public K-12 schools in Oklahoma receive 38.4% of their funding from local revenues (33rd highest in the U.S.), 48.9% from state appropriations (23rd highest in the country), and 12.7% from the federal government (11th highest in the nation). In the fall of 1990, enrollment in Oklahoma public schools numbered a little over 579,000 students. Student enrollment in 2015 is almost 684,000, an increase of nearly 105,700, or 18%, in 25 years. Yet Oklahoma has the third-lowest average per-pupil funding level in the nation, leading only Nevada and Utah. Oklahoma schools are no longer required to have media and library assistants. The Legislature voted in 2010 to allow school districts to divert their annual textbook allocation and library media program funds to general school operations for the next two years. That exemption has now been authorized three consecutive times, through school years 2015 and 2016. As a result, some schools are using textbooks that are up to 14 years old and in tatters, held together with tape. “My school district has not purchased textbooks in 10 years, and my library has not had funding in almost as long,” a Skiatook teacher wrote to a House Democrat on April 20. Full-day kindergarten and a marked increase in pre-K participation led Oklahoma to be recognized as #1 in the nation for early childhood education. However, the Legislature voted to repeal that mandate in 2013. HB 1017 directed schools to provide technology education. Today, roughly 60% of this state’s rural schools still do not have funds needed for technological upgrades. The Information Technology and Innovation Foundation ranked Oklahoma 48th among the states last year in meeting the needs of the “new economy.” The ITIF index employs 25 indicators in five categories (knowledge jobs, economic dynamism, the digital economy, innovation capacity, and globalization) to assess each state’s fundamental capacity to transform its economy and incubate innovation. It took long enough, but I guess they have finally passed SQ 639. I think I’ll pass on the cake.